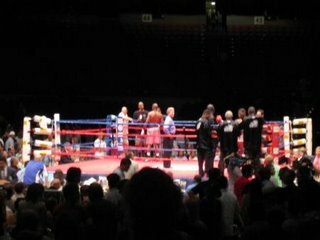 Went to the "Rumble on Red River" tonight, a badly promoted, badly planned boxing event. You can sort of see the empty seats in the picture. All of the fights were mismatches. The best example of this was the last semi-main event pitting "King" James Johnson, Jr., against Billy David Thompson. The guys threw jabs for about 1.5 minutes, then Johnson connected a few times, and Thompson, intending to show that he was tough enough to take punches, exposed his jaw and made a "bring it on" gesture. Johnson immediately connected with a right, Thompson went down, and the small crowd erupted with derisive hoots and laughter. The title fight was also one round, ending in a KO. The highlight was meeting Ernestine, who was displaced by Katrina and who could only shake her head and laugh at how bad the fights were, compared to the fights she went to regularly in N.O. We were in a row of empty seats quite close to the ring, in adjacent seats. When katrina hit she was stranded at the New Orleans convention center for four days, and went straight to the Austin convention center after being evacuated. I offered to get her a beer, and she said she couldn't take the "watered down" stuff. I said "I'm getting a Shiner Bock, it's not watery." She dug a five out of her pocket and I got us two. She had not had Shiner yet, and admitted it was OK. It was funny talking to her, almost everying she's tried to enjoy here: music, food, sports, hasn't held a candle to where she used to live. Even when she caught the Rebirth Brass Band at SXSW, the stage was too small to hold all of the musicians. She said she was taping the taylor vs. wright fight being shown on HBO tonight. It was a small miracle anybody showed up for the Red River Rumble.